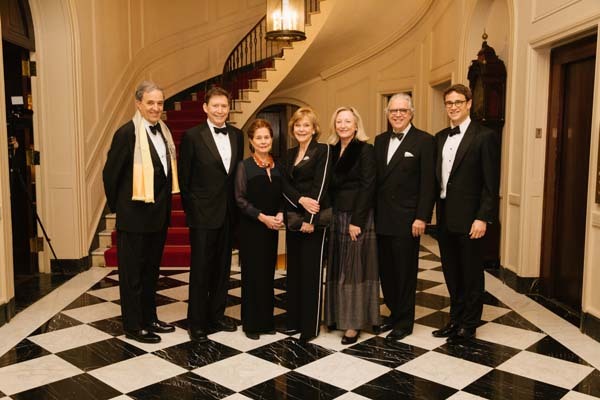 The Vienna Philharmonic Society presented The Vienna Philharmonic Orchestra for over one hundred benefit guests at a private club. There are many grand fundraisers in New York, but some nights are special and this is always because of their hosts. Although the Chairman of The Vienna Philharmonic Society, Marifé Hernández, was unable to attend, her attention was evident everywhere. Resting comfortably at home, recovering from surgery, she still saw to the placement of every guest and every detail. Her beloved husband Joel Bell arranged a first - the evening was videotaped so she could see it. Guests were invited to record their own get-well messages for the much-missed chairman. Her warm presence was felt everywhere. Through generous sponsorship of Vienna Philharmonic Society (in partnership with the Weill Music Institute at Carnegie Hall) Principal musicians from the Orchestra conducted Master Classes with former students of Carnegie Hall's National Youth Orchestra (NYO), all of whom are now Conservatory students in Baltimore, Boston, Chicago, Cleveland, New York City, Oberlin, Philadelphia, and Puerto Rico. The message to them throughout the day was legato – learning to play in a smooth, flowing manner, without breaks between notes, to play with passion, and to play as if you are making your instrument sing. Steeped in the rich history of the 176-year-old Vienna Philharmonic, the instructors emphasized understanding the history of each work and its author, to bring the music to life as the composer intended.